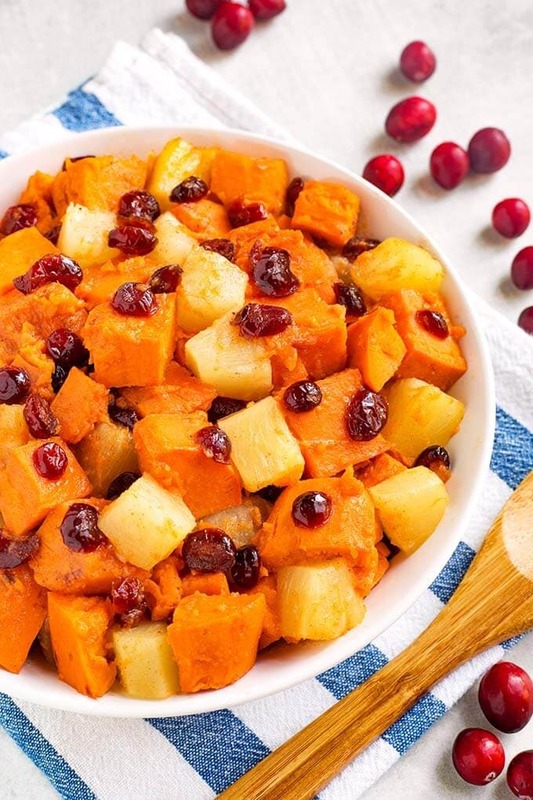 Instant Pot Sweet Potato Cranberry Casserole also has pineapple and warm spices to make this a yummy Fall side dish. It’s fast to make, you will have a wonderful side on the table in 30 minutes or less! 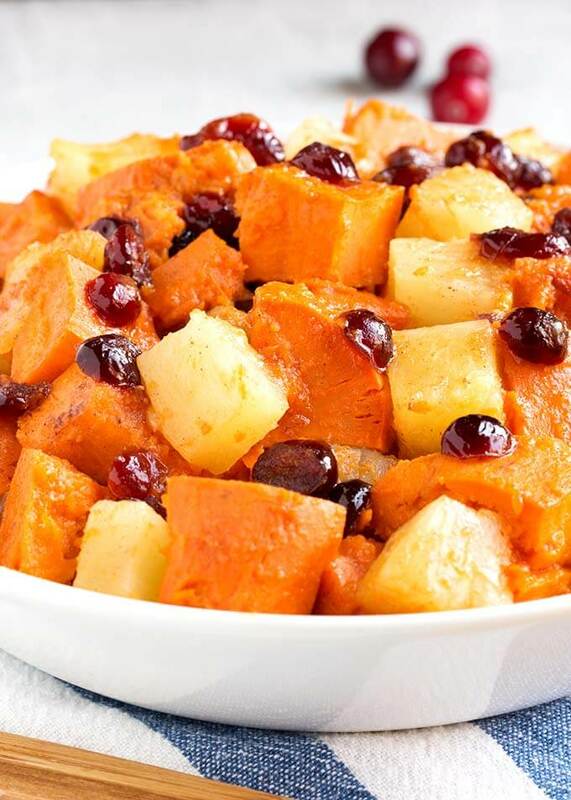 Pressure cooker sweet potatoes with cranberries is a tasty addition to to your Holiday menu. A nice Instant Pot Thanksgiving side dish recipe. Sweet potatoes are so versatile! There are so many yummy recipes that you can make with them. Both sweet and savory. For Thanksgiving we usually have Candied Yams (which are really sweet potatoes). This year I’m making another version. This is a long title, but so tasty! 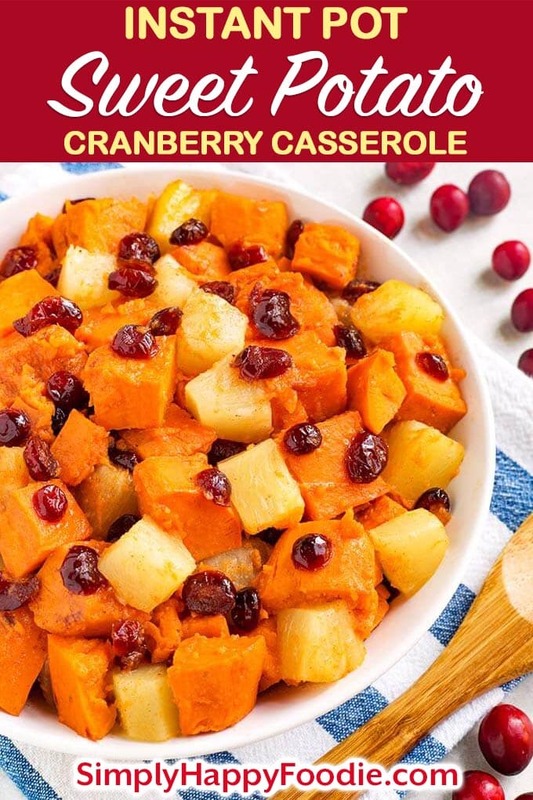 Instant Pot Sweet Potato Cranberry Casserole has pineapple, and some nice Fall spices to warm the flavor up. It is also versatile because you can serve it in chunks, as pictured, or as a mashed dish (see recipe notes if you intend to mash it). This Thanksgiving side dish recipe (or any time of the year) is what I call an Instant Pot® “Dump and Start” recipe. All that means is that you dump the ingredients into your pressure cooker and start it up! No browning, sautéing, or any precooking to do! That, combined with the super fast cook time, makes for a speedy side dish you can have on the table in under 30 minutes, with prep! Feel free to adjust the spices, or the sugar to make this how you like it. If you don’t have any pineapple, use some orange juice instead. Add some peeled apple chunks for another version. Chopped pecans would make a nice garnish to this recipe, as would some shredded coconut! Yum! 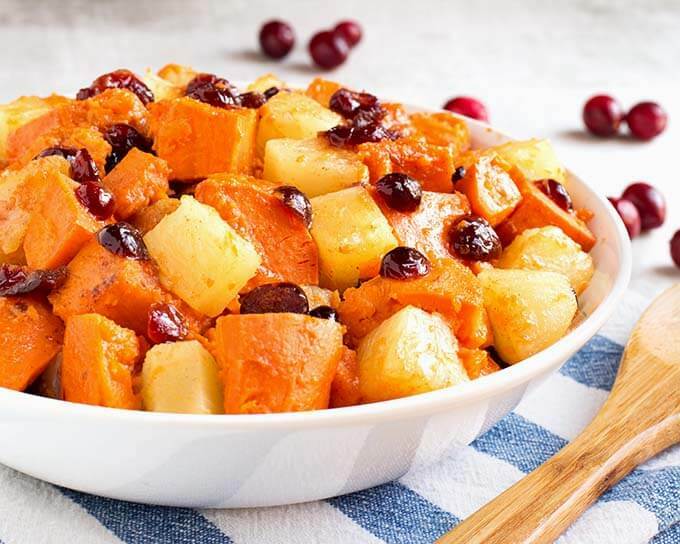 Instant Pot Sweet Potato Cranberry Casserole also has pineapple and some warm spices to make this a yummy Fall side dish. It's so fast to make, you will have a wonderful side on the table in 30 minutes or less! Add the sweet potatoes, cranberries, cinnamon, nutmeg, ginger, and allspice to the pot. Pour the pineapple chunks and their juice over everything. Press the Pressure Cook/Manual button or dial, then press the +/- button or dial to select 3 minutes (5 minutes if you are mashing). It will take a few minutes to get to pressure. When the cook cycle is finished and the pot beeps, Turn the steam release knob to the Venting position to do a Quick Release of the steam/pressure. When the pin in the lid drops down, open the pot and add the brown sugar. Stir gently to distribute it. Then close the lid with the vent open, just for a minute to melt the sugar. *You can use pineapple tidbits or crushed if you want smaller pineapple pieces, or if you are going to mash this up. If you do this, strain the pineapple and pour the juice in the pot (you need 3/4 cup to 1 cup of juice). Then add the pineapple with the brown sugar at the end and let it heat through. Is the pineapple required in the recipe? 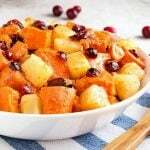 Allergies to contend with but would like the sweet potatoes and cranberries! Any adjustments made ideas when omitting pineapple? Thanks! You can substitute some orange juice. This sounds great! I have a 3qt mini duo IP. How long should I steam for? Is 4 to 5 medium-smallish potatoes too much?. Hi Jan, I think if the potatoes are small, that would be fine. Just go by the cook times I listed in the recipe and they should cook perfectly! Do you think butternut squash could be cooked this way, in place of sweet potatoes? Costco serves pre-cut butternut squash and I like to find new ways to use that. Yes I do, the flavor will be different, as it won’t be as sweet, but you can always sprinkle on more brown sugar, or some honey!